Fire roasted vegetables are my favorite way to prepare veggies. 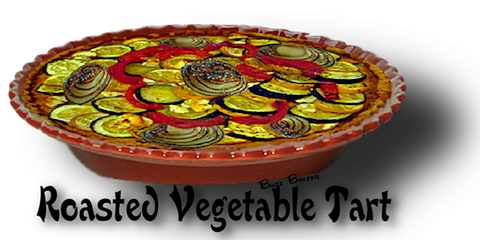 I can think of no better way to bring out the flavor of onions, eggplant, zucchini, asparagus and many other vegetables than roasting them over hot coals or a gas barbecue. Give it a try and you will learn to love veggies. 2. Set aside and cool. 3. Line a 9 1/2 inch x 2 inch tart pan or a pie plate with the Pizza dough or pie crust dough,  which ever you prefer. Bake the single crust for 8 minutes in a 425℉ oven, remove and cool. on the crust,  make sure they are evenly distributed. You may have to cut them into strips to achieve this. a 425℉ oven,  remove and let cool some before slicing and serving. 1. You can reserve a little of the roasted pepper strips for garnishing the top of the tart.